A renal corpuscle, the functional unit of the kidney, shown in blue and pink. 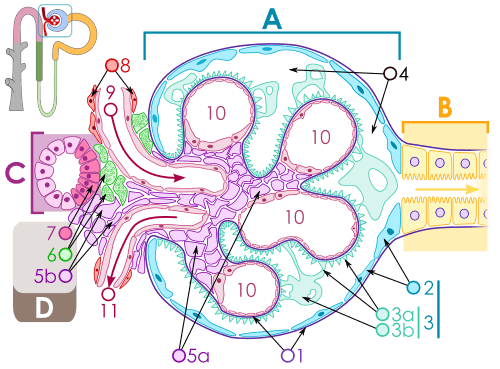 The juxtaglomerular apparatus is shown to the left and labelled D.
The juxtaglomerular apparatus is a microscopic structure in the kidney that regulates the function of each nephron, the functional units of the kidney. The juxtaglomerular apparatus is named because it is next to (juxta-) the glomerulus. The juxtaglomerular apparatus is part of the kidney nephron, next to the glomerulus. It is found between where blood enters a renal corpuscle and the distal convoluted tubule of the same nephron. This location is critical to its function in regulating renal blood flow and glomerular filtration rate. 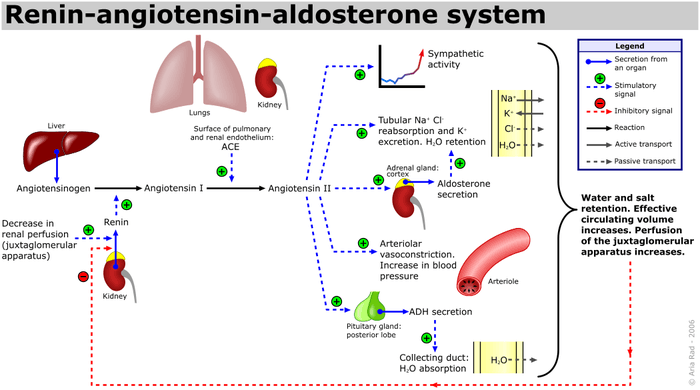 The renin-angiotensin system. It is activated when juxtaglomerular cells are poorly perfused. Extraglomerular mesangial cells are located in the junction between the afferent and efferent arterioles, but their significance in this location is unknown. Renin is also found in these cells. At the point where the afferent arterioles enter the glomerulus and the efferent arteriole leaves it, the tubule of nephron touches the arterioles of the glomerulus from which it rose. At this location, which marks the start of distal convolution, there is a modified region of tubular epithelium called the Macula densa. Cells in the macula densa respond to changes in the sodium chloride levels in the distal tubule of the nephron via the tubuloglomerular feedback (TGF) loop. The macula densa's detection of elevated sodium chloride, which leads to a decrease in GFR, is based on the concept of purinergic signaling. An increase in the salt concentration causes several cell signals to eventually cause the adjacent afferent arteriole to constrict. This decreases the amount of blood coming from the afferent arterioles to the glomerular capillaries, and therefore decreases the amount of fluid that goes from the glomerular capillaries into the Bowman's space (the glomerular filtration rate (GFR)). When there is a decrease in the sodium concentration, less sodium is reabsorbed in the macular densa cells. The cells increase the production of nitric oxide and Prostaglandins to vasodilate the afferent arterioles and increase renin release. Excess secretion of renin by the juxtaglomerular cells can lead to excess activity of the renin-angiotensin system, hypertension and an increase in blood volume. This is not responsive to the usual treatment for essential hypertension, namely medications and lifestyle modification. One cause of this can be increased renin production due to narrowing of the renal artery, or a tumour of juxtaglomerula cells that produces renin. These will lead to secondary hyperaldosteronism, which will cause hypertension, high blood sodium, low blood potassium, and metabolic alkalosis. ↑ "Dictionary.com". Retrieved 11 June 2015. 1 2 3 Ganong. Ganong's Review of Medical Physiology. TATA McGRAW HILL. p. 705. ISBN 978-1-25-902753-6. ↑ Carlstrom, M.; Wilcox, C. S.; Welch, W. J. (2010). "Adenosine A2 receptors modulate tubuloglomerular feedback". AJP: Renal Physiology. 299 (2): F412–F417. doi:10.1152/ajprenal.00211.2010. PMC 2928527 . PMID 20519378. ↑ Burnstock, Geoffrey; Evans, Louise C.; Bailey, Matthew A. (2014). "Purinergic signalling in the kidney in health and disease.". The Official Journal of the International Purine Club. 10, (1,): 71–101. doi:10.1007/s11302-013-9400-5. PMC 3944043 .